Netgear, a multinational computer networking company with headquarters in San Jose CA, manufactures some of the best communication electronic devices in the market. 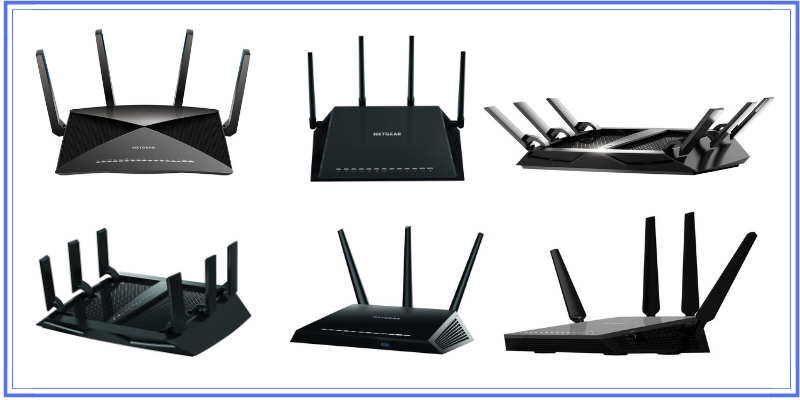 Producing mainly SOHO products (for Small Office / Home Office), Netgear is well known for their home WiFi routers, cable modems, Ethernet network switches, smart home devices and many more consumer electronics. In this article we will focus on Netgear’s flagship WiFi product line, the Nighthawk wireless router models. Please note that the “Nighthawk” brand name is used also on other networking devices such as various combo “cable + wifi router” models, “combo DSL + wifi router” models etc. In this article we are focusing only on the standalone WiFi router devices. The following table illustrates the most important technical specifications of all models to get a quick idea of what they offer. In the rest of the article you will find explanation of the features presented in the Table (and much more info). Before starting to discuss each model individually, let’s first see the most important features and technical specs included in (almost) all models that make the Nighthawk product line a best-buy option for home and office networks. All Nighthawk models are using the newest WiFi 802.11AC standard (with a minimum of dual-band AC1900 speed found on the R7000 device and maximum AC4000 and AD7200 found on the high-end devices). Moreover, the fastest X10 (R9000) router is using also the high-performance 802.11AD standard which is the only one supporting multi-gigabit wireless speeds nowadays (at shorter ranges). Another important hardware aspect you need to consider is the wired port options available. Although we are talking about wireless routers here (most user devices will be connected via WiFi), it’s important to have plenty of wired LAN ports as well. To these wired ports you can connect for example your smart TV, a network printer, a game console, a desktop workstation computer which does not have wireless card etc. So yes, having several LAN wired ports is very useful. All Nighthawk routers are equipped with at least 4 LAN Gigabit Ethernet ports (10/100/1000 Mbps) offering therefore plenty of ports for gigabit wired connections. The flagship X10 R9000 router has 6 gigabit ports and you can use 2 of them for Link Aggregation. This will create a bundle port with 2 Gbps bandwidth capacity which is needed for fast 4K HD video streaming from a locally attached storage device. This is another excellent hardware feature which is available on Nighthawk routers. All models have two USB ports (either USB2.0 or USB3.0) meaning that you can connect a USB hard drive full of content (photos, videos, documents etc) ready to be shared across the whole WiFi network in the home. Moreover, you can have a hard disk with large storage connected to this USB port and serving as the backup storage for the whole family. Imagine being on your laptop working on an important document. You can just copy the document both locally on the laptop and save also a copy to the shared backup USB drive over the network. Starting with the dual-core 1Ghz CPU of the R7000 model and ending with the Quad-core 1.7Ghz CPU of the high-end X10 R9000, the Nighthawk devices are among the most powerful wireless routers in the market. Their CPUs include the popular Broadcom chipsets and also the Qualcomm IPQ8065 on the R7800. The Nighthawk line is equipped with high-power amplified external antennas (ranging from 3 to 6 antennas) that’s why they can cover large homes with ease. Two models (the X4S and X10) support also DFS channels (Dynamic Frequency Selection) which allows the router to use some special frequency channels in the 5Ghz band in order to avoid interference. These special channels are allocated for Radar use and are not used by other WiFi routers, therefore interference is minimized on your own router at the 5Ghz band. This is especially useful if you live in a wireless crowded area and you get a lot of interference from neighbors etc. Moreover, the X10 is the only one using Active Antennas. This type of antenna has an active WiFi amplifier inside the antenna itself (at the top of the antenna precisely) in order to boost signal even further and avoid interference and signal loss. The other models have the antenna amplifier inside the router motherboard. MU-MIMO stands for Multi-User Multiple Input Multiple Output. Not all Netgear router models support MU-MIMO as you can see from the comparison table above, however most of them do. In layman’s terms, routers supporting MU-MIMO serve traffic to multiple devices concurrently (at the same time) while routers without MU-MIMO send and receive traffic to one device at a time. In the multitasking world we live today, users in home networks do many activities at the same time. Some members in your family will be streaming video while some others might be playing online games or just browsing the web. With MU-MIMO you will get a huge increase in performance boost for all your gaming, streaming or browsing activities on the Internet. Beamforming is a feature of the new 802.11ac wifi standard and is fully supported by the Nighthawk wireless routers. In normal wifi communication, the router emits its signal uniformly throughout the area. With beamforming, the router scans the wireless network to find and understand the clients connected to it and sends directional signals to the clients. This means better WiFi performance (throughput), extended coverage in the area, more stable WiFi connection etc. This feature is disabled by default for a good reason. There are some discussions out there that it causes some performance problems and many experts recommend this to be disabled. However, I wanted to include this as one of the useful and important specs of Netgear routers. Basically there are either 2 bands (2.4 Ghz and 5Ghz) or 3 bands (one 2.4 and two 5Ghz frequencies) in wifi AC networks. If you have Smart Connect disabled, then your wireless devices (smartphones, laptops etc) will see 2 or 3 different SSIDs (one for each band) – (the SSID is the WiFi network name). This means you will have to connect manually to the SSID you want (and you have to know the password for each SSID as well). With SmartConnect enabled, you can configure the same SSID name and password for all radio bands. Therefore, your home devices will see only one SSID name (and use only one password). The router will negotiate with the device and decide to which radio band the device will connect without user intervention. Netgear suggests to use Dynamic QoS if your internet speed connection is 250Mbps or lower. This feature enables Quality of Service (QoS) for time critical applications like voice traffic, video streaming traffic and online gaming. Other types of traffic like browsing, file download, torrenting etc, get lower priority when competing with latency sensitive applications. Let’s say that a user in your network is downloading a very big file from a torrent website. Another user is watching Netflix or communicates with Skype voice. If the torrenting user takes up all the available bandwidth then Netflix and Skype quality will suffer. With dynamic QoS, the router identifies the different applications and gives priority (and also allocates more bandwidth) to the time sensitive applications like voice, video etc (thus Netflix and Skype will work better in our example above). 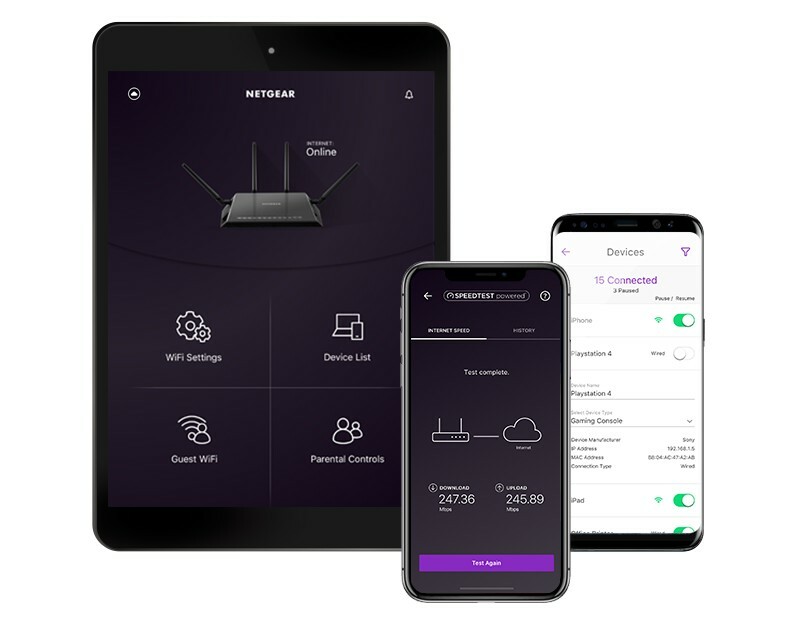 All router models can be managed and configured using the Nighthawk app and a smartphone device. Moreover, all models support parental control (basic and enhanced with subscription), network security features like firewall, NAT etc, and also one device from our list (the R7000P) supports Netgear Armor that uses Bitdefender antivirus for complete protection of the whole home network. If you want to access your backup storage remotely or even create a VPN (using openvpn) you can do that as well. The high-end X10 supports also PLEX media server for playing video and multimedia to all your home gadgets. We recommend the X4S (R7800) model as the best overall value-for-money WiFi router in the Nighthawk product line. As you can see from the comparison table at the top of this article, it possesses some of the most important features that you must look for in wireless devices like very fast speeds (AC2600), MU-MIMO for best performance on all home devices, DFS channels to minimize interference, plenty of processing power (dual-core 1.7Ghz with large 512MB RAM) etc. Moreover, if you look at its price (check above) you will soon understand why we have chosen this as value-for-money. Supporting the Wave2 802.11AC standard (i.e the newest wireless features such as MU-MIMO, Beamforming etc), its a future-proof device that will not be obsolete in a few years. We highly recommend this model for home networks, especially with heavy traffic in streaming, gaming, file sharing etc. For people looking to buy a cheaper device then the R7000P is the best budget model among the Nighthawks (although if you look at the price of this is almost the same as the previous X4S router which we highly recommend). We don’t recommend you to go any lower than this (i.e to purchase the R7000 or anything in the R6000 series) because these models are already a few years old and outdated in our opinion. One great advantage of R7000P over all other models is that it supports the Netgear Armor which is a great cybersecurity feature. Powered by Bitdefender (one of the best software security solutions and antivirus products out there), it offers complete cyber threat protection for all the devices in your home network. Of course this has a yearly subscription cost (currently at $69.99 per year) but it protects all of your internal computers. Undoubtedly, the X10 R9000 model is one of the most powerful WiFi routers you can find, not only among the Netgear devices but maybe in the whole wireless router market. It’s one of the few devices out there that supports the ultra-fast 802.11AD wireless standard. However, you should keep in mind that there are very few clients that can work with this WiFi standard but it will take you well into the future. Some other killer specs that make this model our pick for best performance include the 4 active antennas (with amplifiers in the antenna body itself), very powerful processor (quad-core 1.7Ghz) and 1000MB RAM, its wired connectivity options that include also a 10G port (high-speed file transfer for storage) etc. The biggest drawback however is the price tag. With same or lower price you can buy a WiFi mesh system (like the best selling Netgear Orbi for example) and have similar or even better performance and coverage than the X10. Let’s now see some comparisons between various popular models that many people are interested in. The price difference between these two models is minimal (the R7000 is cheaper by only a few dollars compared to R7000P) so we highly recommend to go for the R7000P between the two. The latter has much better WiFi speed (AC2300 compared to AC1900 of the R7000) and also the biggest difference is that the R7000P supports MU-MIMO in contrast to the R7000. Moreover, with the R7000P you can buy a yearly subscription of Netgear Armor and provide security protection to all of your home computers via the router. Although the specs of X6S look better on paper compared to X4S, we would recommend the X4S router between the two. The X6S is a newer product (released in summer 2017) with a buggy firmware. If you read the reviews you will find numerous annoyed customers who have to reboot the router almost every day because of dropped signal connections. I’m sure Netgear will fix the bugs in the firmware but I would avoid this model for now. On the other hand, the X4S is a more mature product. It has been in the market for a little longer than the X6S and has received many great reviews both from customers and from review experts. Moreover, its technical specs will satisfy most home networking needs. With dual-band AC2600 wifi, support for MU-MIMO and DFS Channels (to avoid interference) and a powerful dual-core 1.7 Ghz processor, its a future-proof router that will serve you well for the next years to come. Both models are working on the Tri-band WiFi spectrum meaning they use one 2.4Ghz band and two 5Ghz bands. The X6 is an AC3200 speed while the X6S wireless speed is AC4000. These are theoretical maximum speeds that are derived by combining the maximum data rate of each band. No WiFi router in the world can achieve these theoretical speeds. Having said that, it makes little actual difference to the user if one router’s specs (in terms of WiFi speed) is a little higher than the other. The X6S has received negative reviews and feedback because of its buggy firmware. The X6 on the other hand seems to be a more reliable and stable device. The only disadvantage of X6 over X6S is that it does not support MU-MIMO which makes a difference in overall wireless performance when having multiple clients on the network. Between the two I would recommend the X6. However, a better choice in my opinion is the X4S as we have discussed and explained in previous sections in this article. In my opinion the R8000 series of Netgear wireless routers is not very successful. The X10 on the other hand is a league by itself. If you can afford the high price of X10, then I highly recommend it over the X6S (or X6). The X10 is a future-proof device that will have many more use cases in the future when more 802.11AD clients will be available in the market. For example, it is expected that future wifi clients will support multi-band frequencies (2.4Ghz, 5Ghz and 60Ghz) thus a router supporting both 802.11AC and 802.11AD (like the R9000 X10) will be more useful and take full advantage of the multi-gigabit AD band. I’ve had opportunity to all three variants of the X6, r7900p (Costco) r8000 & r8000p on my gigabit fiber optic service. In my honest experience the r8000 outperformed the others by a notable figure mainly in Ethernet throughput but also WiFi. Wifi was closer with a 100mb advantage going to the r8000. I have no dog in the fight and infact paid more for the P model routers but after much testing the X6 AC3200 R8000 has proven to be superior for my purposes in every way I can measure. I’m sure somebody that knows more about the exact architecture, firmware in designing intricacies could explain my experience. Even though I tried each with automated features enabled & disabled I think it is the more advanced model attempting to ration the bandwidth thereby not allowing any one device more than it’s share. So for me the more basic manually configured router serves my needs the best. Thanks for your comment. Yes I agree with you that the X6 (R8000) is a much better hardware device compared to the X6S (R8000P) model. The later has a lot of firmware bugs so between the two I would prefer the R8000 as well.